The tomatoes should break down during the cooking process and absorb all the olive oil and juices, you can also crush them at the end to make sure they soak into the sauce completely. Sweat the onion and garlic with the bay leaf in olive oil till softened, add the wagyu mince and sauté until broken down then add the oregano and the basil. Add red wine and reduce completely then add the tomatoes in whole and season with salt and pepper. Cover with lid and allow to simmer on low heat for 1 to 1.5 hours. Adjust seasoning add a pinch of sugar if necessary. Boil the pappardelle in seasoned water until cooked, strain and add butter, parsley and seasoning. 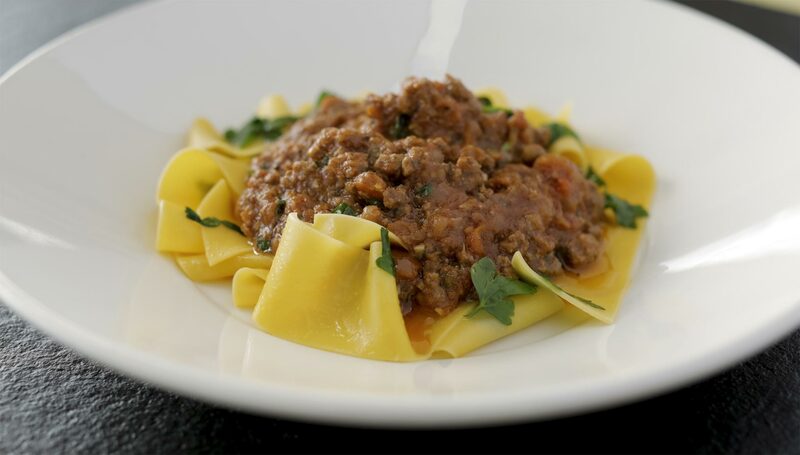 Place in a bowl and then add generous amount of Bolognese sauce.